Being disorganized is a HUGE time and money waster. It’s also stressful and exhausting. Aren’t you tired of not being able to find what you need when you need it? Being late? Forgetting things? Last-minute errands? Piles of papers, books, clothes and stuff…everywhere? Reflect on the year that’s about to pass. What went well (keeping clothes organized)? What could have gone better (paying bills on time)? Thinking about the year ahead, what steps can you take to make 2017 better than 2016? Consider setting New Year’s resolutions if you don’t already. Motivated people who set realistic resolutions, with action plans to achieve them, are more likely to be successful. Also, the timing of resolutions is important. You may have a great goal but success may be difficult if the timing is wrong. When motivation is strong and the timing is right, you’re well on your way! Here are 7 tips to help you get motivated. Aim high enough to challenge yourself but not so much so that success is beyond reach. Make a firm commitment and stick with it. Know the right systems, tools and habits that work for you. What works for one person doesn’t work for everyone. If they are not right for you, don’t give up. Find what will work. It’s worth the effort. Since getting organized is conceptual rather than tangible, use pictures, inspiring quotations or whatever resonates with you to visualize what you want to accomplish. Post these little helpers in one or more prominent spots. Create SMART (Specific, Measurable, Achievable, Realistic and Time-bound) goals. Set as many or as few as you can achieve – realistically. For example, pick a room in your house that you want to organize and this becomes your goal for January. Make a plan and keep chipping away until the room is finished. Remember, you have the entire month. Say your goal for February is to pay bills on time. Create your system and revise it as necessary. Results are easily measurable–if you don’t receive past-due notices, your system is working. Here’s an idea for those who like a challenge: create 12 doable goals, one per month. If you want to start with the above goals for January and February, you already have two so just pick 10 more (e.g., kitchen, closets, garage, basement, recycle old magazines). You can break down large areas (such as garage and basement) into separate monthly goals. Create a plan for each and schedule uninterrupted time to work on it. Have small goals for busy times, such as December (make holiday goals!) and vacation, so you don’t over-schedule yourself and quit. At the end of the year, you will have accomplished 12 goals! Motivation is critical to success when changing any behavior (like getting organized or losing weight). Take into account your situation, personality and time. Recognize goal-setting techniques that work for you. As a professional organizer, I can tell you with absolute certainty that being organized makes life so much easier. There’s a reason it’s a popular resolution. Make 2017 YOUR year to get organized–FOR GOOD! I wish you happiness, health, fulfillment and peace during the holiday season and throughout the new year. 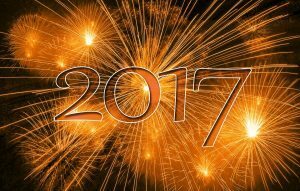 May 2017 be your best year ever! Happy Holidays!